The past couple of weeks I have been so busy hiking and planning hikes that I haven’t had any time to post! So here’s a stab at catching up a bit. The weekend of January 11th and 12th featured hikes in Reston and East Falls Church / Arlington, respectively. On Saturday, the combination of freezing rain and cold/flu season dissuaded all but about a dozen hikers, and we were all pretty thoroughly drenched by the time we finished our 4.5 mile route around Lake Thoreau in Reston. Sunday was sunny and relatively warm, so a lot more hikers turned out for a pleasant hike along Four Mile Run and the W&OD Trail in East Falls Church and Arlington. I was surprised to see a couple of turkey vultures hanging around one spot along Four Mile Run, their presence explained by the remains of an unfortunate deer on the stream bank. Apart from that, the 6-mile hike more than made up for the soggy hike the day before, for those that attended both hikes. Over the past month or so, at least one day of every weekend was overcast and rainy, but this past weekend we actually enjoyed three days of nice weather for hiking! Saturday was a walk around Old Town Alexandria, requested by one of our group members well over a month ago, specifically for the afternoon of January 18th for some reason. Unfortunately, scheduled that far in advance, the event filled up to the maximum number of hikers allowed without a county permit (75), leaving people queued on the waiting list. To ease the pressure I scheduled a repeat walk for the next day, January 19, to give more hikers the opportunity to attend. In addition, to make the walk more interesting than just wandering around town, I published a printable 4-page guide (pdf) with a map that outlined the route, identified 32 historically and architecturally significant landmarks around town, and described each one. Although I was not too fond of the afternoon timeframe, both walks were very pleasant and hopefully informative for newcomers to the area. You can download the guide here, and a Google map of the route is available here. Monday was a Federal holiday, so I had planned a hike to North Marshall Mountain, which I reconnoitered last August. But it was not to be: while forming up at Vienna Metro Station for the carpool to the trailhead, we found out that the National Park Service had closed Skyline Drive, allegedly due to icy conditions. This wrecked any idea of going to Marshall Mountain, but we detoured to Bull Run Mountain, which I’ve hiked many times before. A beautiful sunny day, about 58 degrees, and a fantastic view westward from the sheer cliff at the summit! I think the impromptu hike probably turned out better than the planned hike would have! 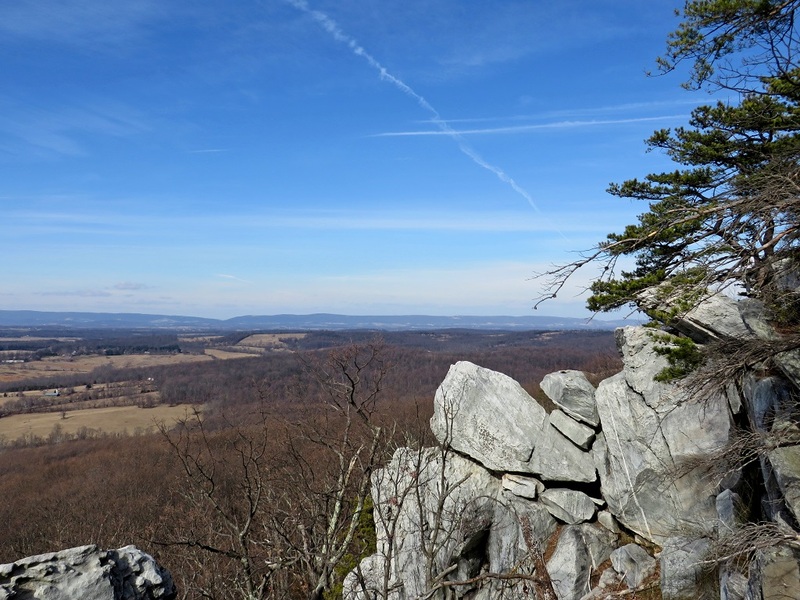 This entry was posted in Hiking, Photography and tagged Appalachian Trail, Bull Run Mountain, nature, North Marshall Mountain, old town alexandria, outdoors, Shenandoah Mountains, Skyline Drive. Bookmark the permalink. Too bad you had rough weather for your hikes, but you did manage to get some great shots. One of the many things I miss about the DC area are the wide variety of hiking and biking trails. I’m glad the weather cooperated for the Bull Run hike. Great photographs! Thanks! I’m sure those in more northerly climes would scoff at considering a bit of freezing rain to be harsh weather! In closing Skyline Drive, it is probable the Park Service was considering the consequences of leaving the park open, and then having hundreds of visitors inside the park when the snow started falling. Thanks! The patience and flexibility of the folks in our local hiking group is really remarkable. Rather than the grumbling and complaints you might expect, everyone picked up and drove to the new trailhead without missing a beat, and I suspect overcoming the unexpected adversity made the hike that much more gratifying! Wow! You are an awesome hiking guide! If I am ever there visiting I am so signing up for a hike…a 4 page guide so nice! Why thank you! By all means, we do a hike or two every weekend and you’re always welcome to join us!